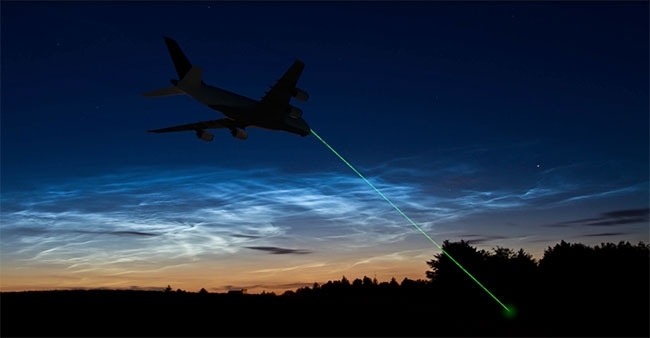 Laser strikes against aircraft have been a concern since the 1980s, and part of the problem is that handheld laser pointers are becoming both less expensive and more powerful. A handheld laser capable of distracting a pilot can cost as little as US$15. Their strength has also increased. Ten years ago, a green 300-milliwatt laser was usually only available to researchers. Today, 300 mw green lasers are easily available online for as little as US$17. When a laser beam hits an aircraft windshield, tiny scratches and dirt on the windshield create a glare effect which spreads the light across the pilot’s field of vision. Pilots do not see this light as a small beam or dot. Instead they experience a large glow which can be difficult to see through. A laser beam becomes wider over long distances and may grow to a few inches or even a few feet in diameter. A laser strike can cause considerable distraction or temporary flash blindness (lasting a few seconds or minutes) to a pilot usually during a landing or takeoff. Most laser strikes occur during the approach phase of a plane’s descent. Laser strikes have increased so significantly over the past few years that many countries have banned handheld lasers, including New Zealand, New South Wales, and Australia, making carrying a laser illegal without a good cause. Both in Canada and the United States, there are currently no legislative measures preventing high-powered lasers from being purchased for personal use. The head of the Air Canada Pilots Association wants Ottawa to put handheld lasers on its list of prohibited weapons. That would allow police and border agencies to seize devices that are increasingly being used to target crew while in Canadian airspace. While there is no law in Canada preventing the personal ownership of dangerous laser devices powerful enough to impede aviation and endanger pilots, pointing a laser at an aircraft is illegal and a criminal offence. Offenders will be charged and could face fines up to $100,000, five years in prison, or both, according to the ACPA. With laser strikes on aircraft on the rise, there may be an easy solution at hand. Airbus wholly-owned subsidiary, Satair Group and Metamaterial Technologies Inc. (MTI) and its optical filters division Lamda Guard of Halifax, N.S., have signed a Memorandum of Understanding (MoU) which will lead to an exclusive multi-million-dollar global distribution agreement to bring MTI’s laser protection product metaAIR TM to the civil aviation market. metaAIR is nanofabricated as a flexible metamaterial optical filter which can be applied to any transparent surface, such as the inner surface of an aircraft’s cockpit windscreen, to control unwanted light sources while not interfering with visibility. The filter deflects harmful laser beams aimed at aircraft windscreens even at high power levels and from wide angles preventing the beam from reaching the inside of the aircraft cockpit. In addition to laser protection at night, metaAIR also features new types of optical protections such as Ultraviolet ray protection for daytime operation at cruising altitudes, another long-established concern for many flight crews. Lasers can distract and even harm pilots during critical phases of flight and can cause temporary visual impairment. More than 2,000 laser incidents were recorded in the U.S. in the first four months of 2017 alone according to the Federal Aviation Administration (FAA). In 2015, there were some 10,000 laser incidents reported to the FAA, the U.K. Civil Aviation Authority and Transport Canada. The top five U.S. cities affected by laser strikes in 2014 were Houston, Los Angeles, San Juan, Phoenix, and Las Vegas according to the FAA. Laser illuminations were up 33 per cent between 2015 and 2016. The Top five cities in Canada affected by laser strikes are Toronto, Montreal, Vancouver, St. Hubert, Que. and Ottawa, notes Transport Canada. The biggest targets in the U.K. are Heathrow, Glasgow, Birmingham, Manchester and London City Airport. While Airbus and its airline partners have been onboard with their support since Day 1, the technology will be driven by the airline industry as a whole, including regulators, added Palikaras. Laser strikes are a global concern, although it would appear it’s a bigger problem in North America, only because the media tends to give them more coverage than elsewhere, said Palikaras. There is also a correlation between population density and air traffic volume. In fact, the biz jet market could be an interesting one for MTI, since VIPs who fly on them, likely have bullet-proof cars or vests for personal safety, so this laser strike technology would have a natural appeal for them, Palikaras suggested. Satair Group’s involvement follows two previous agreements signed between Airbus and MTI’s Lamda Guard division over the past three years. In 2014, MTI entered Airbus Corporate Innovation’s Start-Up 2 Partner program, which aims at building mutually beneficial partnerships with disruptive innovators (an innovation that creates a new market and value network and eventually disrupts an existing market and value network) and start-up companies. While setting the ground for future business arrangements, with the support of the Airbus Aircraft Security team, the program also evaluated, tested and tailored metaAIR for potential application on to its aircraft. Earlier this year, a new agreement for the validation, certification and commercialization of the product was announced. Satair Group is now moving this relationship to commercialization and will deploy its global presence and extended distribution and parts support services to all commercial aviation market segments with a full metaAIR service-offering package. While other companies offer protection against laser strikes, MTI’s technology is unique in that the optical filter can be applied without removing an aircraft’s windshield, explained Palikaras. The value proposition goes beyond anything else on the market, he added. “We are delighted to pick up the baton for this exciting technology from our colleagues at Airbus Corporate Innovation and Airbus Aircraft Security who have steered it through the verification and testing stage. With our first mover advantage and through our global reach and excellent relationships with operators we will ensure metaAIR gets exposure to all aircraft categories and to airlines, MROs and corporate operators worldwide,” Bart Reijnen, CEO of Satair Group, said. Satair will choose an experienced partner for Supplemental Type Certificate (STC) development to ensure metaAIR meets airworthiness and certification requirements for different aircraft types. Certification approval initially from the FAA, European Aviation Safety Agency and Transport Canada Civil Aviation is expected to be granted in early 2018 with other relevant jurisdictions following later. Certification should be straightforward, said Palikaras, since the product doesn’t have any moving parts. The metaAIR product will be developed initially for the Airbus A320 family, followed shortly afterwards by all other Airbus and also Boeing types, as well as for other commercial airliners. Satair also sees demand for this product coming from business and general aviation and rotary wing customers. 2,000 – Number of attacks in the first four months of 2017 in the U.S.
Quotable – “It was when I looked over to him that I could see the green light was being reflected off the cockpit window. He looked at me and said, ‘I am have trouble seeing out of my right eye.’ ” – Air Canada pilot Ian Smith, quoted in a CBC article last year, describing his first officer’s reaction to a laser strike on approach. Smith would like lasers to be banned and put on the list of prohibited weapons.